Editor’s Note: We need to start putting some serious pressure on the Trump administration over the South African Question. 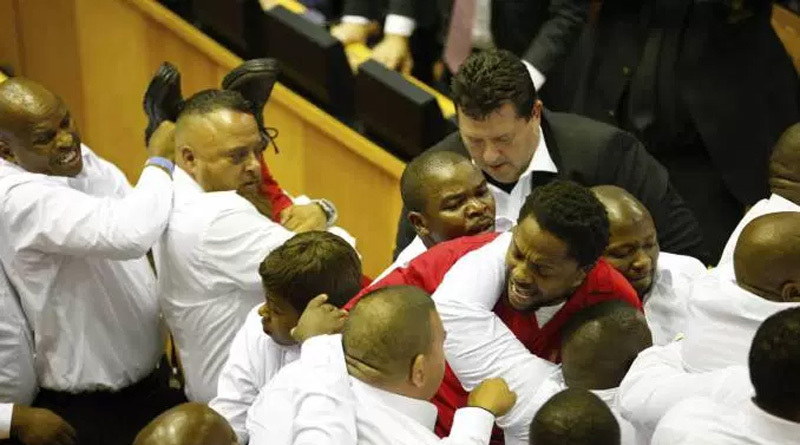 “South African President Jacob Zuma pledged Thursday to break up white ownership of business and land to reduce inequality, in a State of the Nation address disrupted by a fistfight, walkouts and a release of pepper spray in the parliamentary chamber. Mr. Zuma said that his government would this year propose changes to the country’s competition rules to make it easier to “deconcentrate” high levels of ownership in certain sectors and open up the economy to black-owned businesses. This is a declaration of war on the White community. It is the end of law and order. It is the end of property rights. It is the final nail in the coffin of multiracial democracy and the beginning of unshackled black supremacy. Soon, the result will be the decimation of civilization in South Africa. Look no further than Zimbabwe to see what is about to happen to South Africa. “It is a surreal, instructive sight. On steep green hillside north of the windswept city of Port Elizabeth, hundreds of tiny brick cabins – each not much larger than a telephone booth – stretch out into the distance in neat rows. “We call this place Toilet Valley,” said 36-year-old Suzanne Stoltz, opening her cabin door to reveal a solitary plastic toilet and a few bags of clothes that she’s stacked beside it to keep out of the rain. The toilets – well over 1,000 in all – each sit on a larger slab of concrete, as if builders had started to erect proper homes, but lost interest early on. They are a vivid symbol of the failures of the local authorities here in Nelson Mandela Bay. “It’s crazy. They tell us we’re going to get houses in three months’ time. But we’ve been waiting for three years,” said Ms Stoltz, a mother of three, who like her neighbours has built herself a small shack out of corrugated iron beside her toilet. Like many here, she has no job. The same complaints – in varying permutations – echo across the surrounding townships. Toilets without houses. Houses without water. Whole neighbourhoods without sewage pipes. Schools so overcrowded they’ve been closed down. Thousands of people dependent on a single tap in a muddy field. In Port Elizabeth, whistleblowers have uncovered billions of rand that have either been misspent, stolen, or are simply lost. Misrule. Corruption. Violence. Poverty. Decline. Black Supremacy. These are the fruits of the “Rainbow Nation.” The fake news Lügenpresse doesn’t talk much about South Africa these days. Julius Malema, the leader of the Economic Freedom Fighters, is famous in South Africa for singing “Kill The Boer.” He seems to have been pushing the South African political spectrum toward its logical conclusion over the past few years. The moral of the story here is that someone always rules and in multiracial democracies it will be one race or the other. Eugene Terre’Blanche was so right. 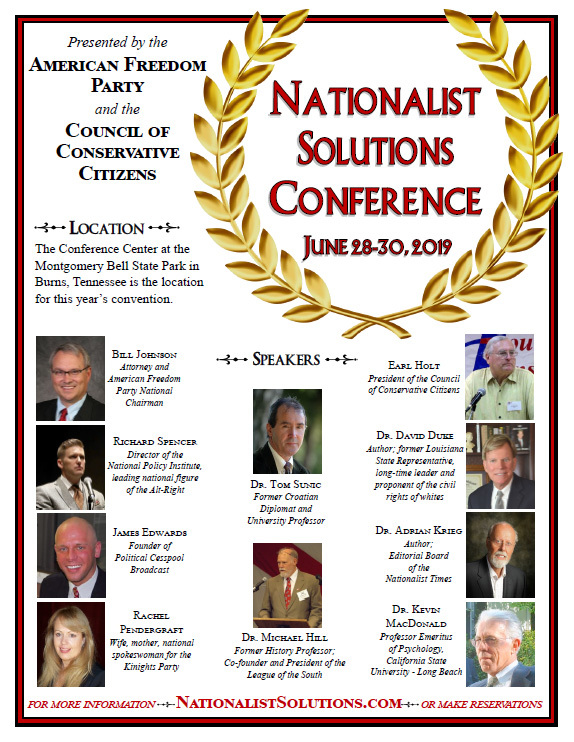 If you are new to our movement and aren’t familiar with the martyrdom of Terre’Blanche, it was one of the signal events of the last decade. Note: We all need to contact our representatives in Congress and tell them that we support the United States imposing sanctions on South Africa. What were you expecting, the Lincoln-Douglas Debates…?